The University of Maryland Medical Center describes folliculitis as the inflammation of one or more hair follicles caused by irritation, shaving of the head, or blockage. Damaged hair follicles are susceptible to infection, and in most cases of folliculitis, the damaged follicles become infected with the bacteria Staphylococcus. White, itchy pustules or pimples form around the follicles on the scalp and eventually crust over. In deep folliculitis, boils or carbuncles may erupt. Although folliculitis responds to treatment, it can recur. To treat the bacterial infection, a topical antibiotic such as mupirocin or an oral antibiotic such as dicloxacillin, penicillin, methicillin or vancomycin may be prescribed. According to MayoClinic.com, Staphylococcus bacteria are very adaptable to antibiotics, often requiring stronger and more toxic medications. Testing is important to identify the bacteria causing the infection in order to best choose the antibiotic that will be most effective. 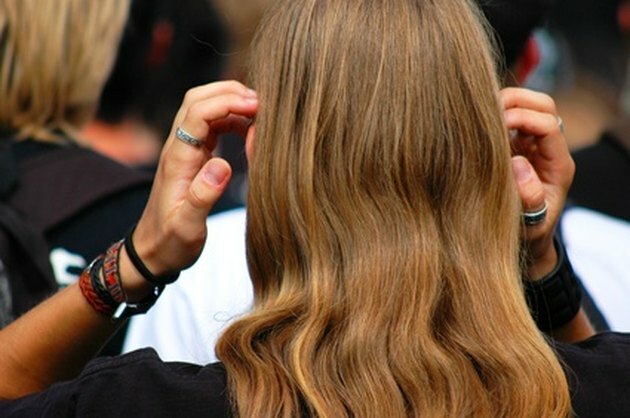 MayoClinic.com suggests using an antibacterial soap or shampoo for folliculitis on the scalp. A warm compress or washcloth over the affected area will help soothe, relieve the pain and drain the pustules. An over-the-counter antibiotic ointment can be applied to infected skin. To relieve itchy scalp, use an over-the-counter hydrocortisone cream or an oatmeal-based lotion. MayoClinic.com also suggests a compress of a white vinegar solution of 1 1/3 cups of warm water and one tbsp. of white vinegar. Keep combs and brushes should be cleaned after every use and shouldn't be shared. If shaving is a must, MayoClinic.com suggests using an electric razor to shave the scalp instead of a blade, and apply a soothing lotion afterward. It is important not to share towels or facecloths, and to launder well after every use. Hats and scarves should be cleaned after each wearing. If a hair follicle becomes severely infected, boils or carbuncles may form. A boil is a painful, swollen red bump, filled with pus. A cluster of boils is a carbuncle and causes an even deeper infection. To drain, the physician makes a small incision in the boil or carbuncle and allows the pus to empty. A sterile gauze cover allows drainage to continue.